No Pickin' Party This Week! But we've no lack for music! This week is the ACTUAL last Thursday, which means there really is a CasHank at Buttermilk tomorrow night. John Pinamonti is at Sunny's on Friday, Blue Harvest is at Jalopy, and Rob Ryan is having a send-off at the Rodeo Bar. Saturday there's a special show at Jalopy featuring one-half of the Otis Brothers (namely, Raoul), otherwise known as Bob Guida, along with Steve Uhrik, Peter Kohman and Mike Saccolitti. Monday, Copper Kettle is at the Parkside, followed by Michael Daves' jam, and then Michael is playing again on Tuesday at Rockwood, while Fresh Baked will be at Abilene. This newsletter attempts to go out every Wednesday, so send us your gig notices, myspace bulletins, facebook posts and carrier pigeons by Wednesday for inclusion. Hello everyone. It's another weekend jam-packed with good music, and music-packed with good jams. Tonight is the CasHoot Hankenanny Jamboree, or is that the HootHank Cashenanny? Whatever it is, it's lots of good old four-chord country music at Buttermilk, 5th Ave and 13th Street. Bring your instrument and you can play too if you can find room on the stage. It's a blast. Fun, too. The Mud Brothers are playing at Sunny's on Friday night, and as Mojo says there is a new art exhibit up, so take a look at that. Saturday night the Y'All Stars are playing a too-rare show at Googie's, with Miz Liz and the Vipers starting the evening off at 7:30. Also on Saturday night, Michael Daves and Jen Larson are playing at Banjo Jim's. Thanks to Anina for alerting us that there's a new jam in town on Wednesday nights in Park Slope, at a place called Vin Rouge. Too late to make it over there this week, but it's called the "Angel Band" jam. See the calendar below for details. Otherwise, it's the usual jams and lots of good shows of course. Hello. We have a quick weekend update to add some more shows and to let you know about a change for Monday. Tonight at Banjo Jim's Eli Smith is putting on a big show featuring American String Conspiracy, Alex Battle's Whisky Rebellion, Vincent Cross and Good Company, Rolf Hamsen. And out in Hoboken the Second Fiddles are playing with David Bennet Cohen joining them on piano. Also tonight, Abigail Washburn is bringing her Sparrow Quartet to BB King's. It's her with Bela Fleck, Casey Driessen and Ben Sollee on cello, and their show at Joe's Pub last night was absolutely incredible. (http://photos.kenficara.com/sparrow) It's an early show (7:30) so you can still make the local gigs after you, but it'll cost ya! Also please note: The Jonah and Jordan show, follwed by Terri Ann Mclean and Hi Rise, are at the Parkside *NEXT* Monday, the 21st. This Monday, the 14th, Copper Kettle plays at 7:30 followed by The Shade. Please send your emails (or MySpace bulletins) by Wednesday for inclusion to pickin@ponkiesburg.com, and if you have any trouble write me directly at pickin-owner at ponkiesburg.com. Hello everyone. Glad we're done with winter. Seems like it gets shorter every year, doesn't it? I'm on the road this week so I will leave most of the details to Mojo, or check the calendar below! 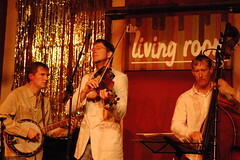 Rob Hecht's new band had its debut performance at the Living Room last night. Featuring himself, Tuey Connell, Jim Whitney, Ross Martin, plus a guest appearance by Dennis Lichtman, the band put on a spectacular show of original music. This is a newgrass outfit to watch for. Happy new year, everyone! Apologies for our absence last week, but newsletters get holiday vacations just like everyone else. However, I'm sorry that some of you went down to Kili on Sunday and found no jam, but we'll be back there this coming Sunday and I'll buy you a drink if you made the trip last week. But we're back in force this week with a LOT to tell you about. So much that I know I'm going to miss some great music this weekend no matter what, but that's not a bad problem to have. Tonight, of course, there will be Good Times with the Sheriff of such at the Baggott. Meanwhile Jonah Bruno will be out in Brooklyn at Bar BQ with the South Slope String Band. Tomorrow night, Reckon So is going to be at Banjo Jim's, with a special guest -- Larry Campbell, who's played with lots of luminaries including Bob Dylan. If you'd rather play than watch, you can head to either Freddy's or Jalopy for a jam. Friday night (and from the looks of it, Saturday morning), Jonah Bruno is hosting an all-star all-night tribute to John Hartford at Jalopy. This promises to be pretty amazing. On the bill will be Jones Street Boys, Dawn Breakers, Alex Harvey, Toby and Casey King, Josh Stacy, Tom Bailey, Jen Larson, Doug Hatt, Joe Choina, Jake Tilove, John Fletcher, Brian Hollander, Charles Puckett, Sarah Alden, Harris Wulfson, Brad Einhorn, Five Deadly Venoms, Audra Tsanos, Jennifer Milich, Tom Bierowski and (really) more. And the house band looks pretty hot too. Also on Friday, Kate Giampetruzzi will be playing Sunny's, joined by some special guests including Tone Johansen, Rick Shields, Trip Henderson and Emily Eagen, Charlie Shaw, Kari Denis and myself. We'll be doing some of Kate's beautiful new originals, some Kate&Lou tunes, and some traditional songs. Andy Cartoun also informs us that legendary bass player Mike Bub will be in town for two shows with alt-country songwriter Jimmy Stewart, one at the Rodeo Bar on Friday night and the other at the Living Room on Saturday night. Sunday night, fiddler Rob Hecht will bring his Irreducible Rascalities to the Living Room. The band includes Tuey Connell, Ross Martin and Jim Whitney, and they'll be doing some originals. They're all great, creative players so check it out. Monday is the first Monday of the month, which means Michael Daves' jam will be at the Parkside, preceded by Sheriff Uncle Bob and Friends. And you know the Sheriff has a LOT of friends, so don't miss it. Tuesday, rest up, because you'll be out late at the Baggott on Wednesday. And we'll tell you what's happening next week; please send your emails (or MySpace bulletins) by Wednesday for inclusion to pickin@ponkiesburg.com, and if you have any trouble write me directly at pickin-owner at ponkiesburg.com.